New Media Seminars – 4/29 – New Date Announced! 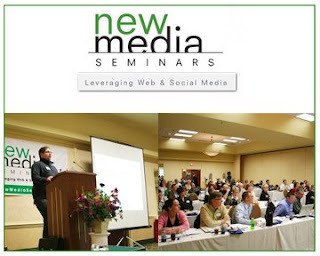 Due to the overwhelming response from previous New Media Seminar this past Tuesday, there is an additional date added 4/29/09 at the Holiday Inn Select – Koger Center. Please go to www.NewMediaSeminars.com for more information and to purchase tickets online! Join nationally recognized new media expert, Dave Saunders, President & Chief Idea Officer at Madison+Main, as he leads like-minded business owners and marketing professionals during a fun and informative New Media Seminar. Learn all about the tools, the mediums and the techniques to enhance your business from a panel of experts including Joshua Barber, Creative Director at Madison+Main, Special Guests and other local digital communications and SEO/SEM experts.